President Trump met with North Korean Dictator 26 days ago. Since that time, Trump has claimed a major victory (it’s not), called Kim Jong Un “a very talented man, loves his country very much” (he kills his own family members and citizens) and has said North Korea is most definitely prepared to dismantle their nuclear arsenal, despite satellite footage from CNN that shows an upgrading arsenal. Now, Dictator Un is stroking Donald Trump’s ego, despite the fact that he gave up pretty much nothing during their meeting. Here’s the note Kim Jong Un has sent to Trump, which the President tweeted on Thursday morning. The idea of “practical actions” is hardly a firm stance issued by the North Korean dictator. In fact, it appears to echo concerns that Trump did nothing more than give up a bunch of concessions without having Kim commit to a hardline stance on dismantling his country’s nuclear ambitions. It has already been suggested that Donald Trump will host Kim Jong Un for a second meeting, perhaps in New York City. 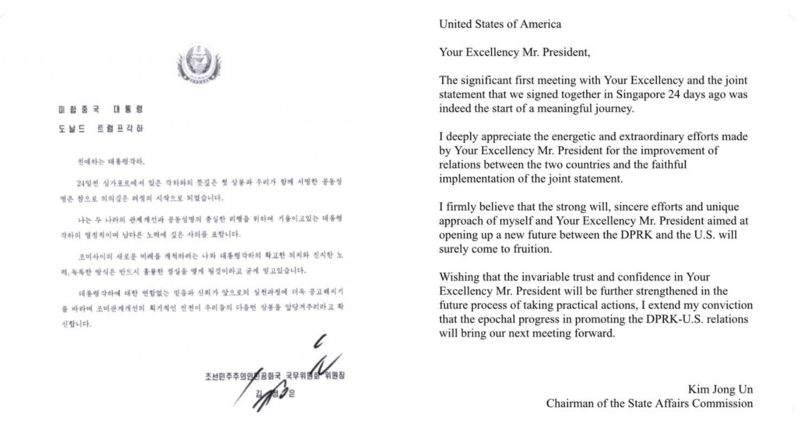 The fact that Kim Jong Un’s letter says Trump took “energetic and extraordinary” efforts, it’s most telling that Un admits only to taking “future process of taking practical actions,” but says nothing of what was achieved during the Trump-Kim Summit.